In 1990, then President of Sri Lanka R. Premadasa announced that he would extend the broad-gauge coastal railroad from Matara up to Kataragama--and that nothing would stop the Goverment from implementing his plan. In hindsight, one may surmise that his plan did not enjoy the patronage of God Kataragama, or else it would have succeeded.  For, as in several previous instances when the Government pledged to complete a railroad to Kataragama, circumstances intervened to prevent the railroad from being built. 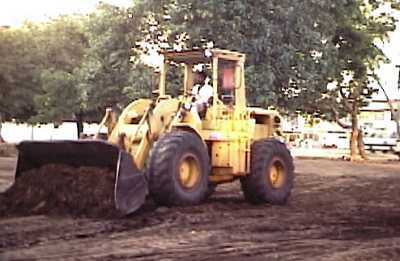 Earth-mover leveling ground for the Kataragama bus station in 1987. Government schemes seldom consider the long-term impact of urbanization upon Sri Lanka's sacred sites and surrounding environment. As the traditional custodians of God Kataragama's lore well know, Kataragama's difficulty of access is no geographical accident. Deviyange Kaele--the God's own Forest--is no ordinary place. It is a magical forest, and is not a place to be tampered with blindly by outsiders who are uninitiated into its mysteries and therefore both uninformed and unauthorized to meddle in the God's own Royal Business. Any complaints about Kataragama's natural disposition should be lodged directly at Kataragama, atheists included. 'Feasibility', ie. practicality, here seems to mean nothing other than commercial viability. Will studies also be conducted of the deep ecological, cultural, or other dimensions less obvious than economic calculations of net worth in terms of dollars or rupees? Does anyone expect Korean engineers to understand what they would be doing in Kataragama? Or, for that matter, do even Sri Lankan engineers understand, when many a sage has been baffled by Kataragama? This sounds like the classical American solution to the world's problems: hurl money at it, busy yourself and thank God that you are so rich and intelligent. Now Koreans and Sri Lankans are doing it also. The sense among the custodians of Kataragama's traditions--the swamis, bawas and others immersed in Rājakāriya ('the King's Business')--is one of dark foreboding at this latest of schemes to 'develop' (that is, 'improve') Kataragama. Unbridled meddling in Kataragama by the rich and alienated of Colombo and elsewhere is today visible in the predominance of commercial considerations at the jungle shrine-turned-bazaar. Who will accept the responsibility? Without warrant or waran, what business, what authority has anyone to institute irreversible changes in Kataragama? The critical issue here is not a question of Kataragama's popularity or ease of access. Rather, it is one of bolstering the very social and commercial forces that threaten the shrine's sacred character. Does anyone believe that the shrine's character can be restored once it has been irrevocably altered? Pumping money into Kataragama only serves to shroud its magic even further. This is not to say that the railroad could not be extended up to, say, Tissamaharama (19 km before Kataragama) from where pilgrims to the holy shrines could proceed on foot or in any fashion that they please. But further commercial exploitation along these lines of Kataragama's untold possibilities is filled with unseen perils and is a matter that deserves the closest public scrutiny. After this project, what fresh improvements will our public servants think of for Kataragama? Perhaps amusement parks with thrill rides and video arcades? 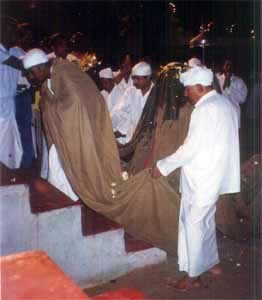 Behold, the Kali Yuga comes to Kataragama! But actually, who knows? Perhaps also this is all part of the master scheme of Kali Yuga Varada Himself, whereby He uses peoples' own self-interests as the lever to turn their perception of Kataragama completely around. In that case, we might all brace ourselves for surprises to come. But in the meantime, let us not seek ruses or excuses to pawn off the responsibility to future generations for our own eager but misguided actions. We may fool ourselves from now until Kingdom Come, but no one fools Him. Without exaggerations, one could paraphrase and say that the railroad to hell or Kataragama is paved with good intentions. But does anyone know where this railroad will take us? No doubt, there are enough good intentions all around. But who is railroading whom? Perhaps it is timely now for someone to blow the whistle on this runaway train of thought. The above statement expresses my considered opinion in the light of years of diligent research in Kataragama. Thank you for bringing it to the attention of readers.